The Billionty-Oneth Geek: UNSTOPPABLE!!!!!!!... yet stoppable. Rottentomatoes isn't always the greatest indicator of when a movie is good. Case in point, Unstoppable. Currently, it's sitting pretty with 86% positive reviews. However, that's a deceiving number. If say, 9 out of 10 reviews gave the movie a marginal thumbs up, it would end up looking like a 90% on RT. Deceiving. However, referencing RT and Metacritic will give a fairer look at the critical reviews. MC gives an aggregate score based on professional reviews, which may give a better gauge on how a certain piece of entertainment is doing. On MC, Unstoppable garnered a 69. I think that's a lot more fair than 86%. 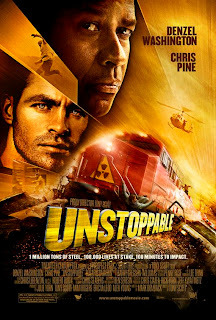 Unstoppable is a film by Tony Scott featuring frequent collaborator, Denzel Washington, and the new Captain Kirk himself, Chris Pine. It's as you've seen it in the trailers; there's a runaway train, there's Washington, there's Pine, and they try to stop it. Whatever you think would happen probably did. It's one of those sort of movies. And it's why I didn't understand the RT 86%. It wasn't until after I watched it that I looked up its MC score. Still, it was enjoyable for what it's worth. I liked it in that there were characters that you could get behind and relate to. They're not superstars or superheroes in the typical fashion. They're regular joes that want to do good and understand their place in the grand scheme of a situation. I guess what's unique about Unstoppable compared to other Tony Scott movies is that there aren't really any good guys are bad guys. The "good" guys are just a bunch of regular train workers. The only "bad" guy is the runaway train, and really, it's not a bad guy either. It's just a train doing what it was told to do: move. It's not its fault that some jerk forgot to put on the brakes and jumped out of the train before doing so. If there's nothing else in the theater you want to see, then I guess it wouldn't hurt to choose this movie by default (I wouldn't blame you, the selection is looking pretty shittay at the ol' cinemas). It's a short review, but really, there's not too much to say. Til next time, later geeks!